Hi all it's Cody! Mom and I heard that today is National Attitude Day. Well, we could NOT be happier about that! In our house EVERY DAY is "National Attitude Day and since I am a CAT, I much prefer that they name it "National CATTITUDE DAY!" To those who think that National Attitude Day means you should celebrate the day by having a GOOD attitude, let me tell ya this............YOU interpret and celebrate YOUR way, Mom and I will celebrate OUR WAY. I AM A CAT, A CAT WITH CATTITUDE. Mom and I are kindred spirits, we see things the same. ..................there's no Pollyanna stuff goin' on around here. Good or bad we are ALWAYS gonna "keep it real." We ALL have attitude here! I like the idea of Cattitude day! Your Catitude is furry much enhanced by that bow tie, Cody! I believe this image of the current days catitude is laced with some stink eye?!? Oh yes, plenty of catitude around here with out two felines every day of the year. Cody your catitude is radiating from your face!! That is an excellent photo for showing your catitude, Cody. I've got one of my own too, Cody. I get this. Cody, such a terrific photo of you; your eyes looks spectacular, and that bowtie is adorable! I've met your mom in purrson, but I think she's got a delightful attitude, maybe because she's feisty. We try to have a good attitude, but Brulee has turned on her Persian scowl extra hard today. You are a fine looking feline, Cody! Cody, I would love to experience your cattitude in person! You know how things should be - and you ensure things are exactly that way. I remember a meme saying, "I'm totally flexible. As long as everything is my way." Next favorite, "I don't have an attitude problem, you just keep ticking me off!" Our cattitude is a tad on the Pollyanna side. Just sayin. MOL! What a great photo of you, Cody (and I'm not pulling any Pollyanna stuff when I say that). Happy Attitude and Cattitude Day to you and Mom. Big hugs! You have loads of cattitude Cody (and so does my cat)! 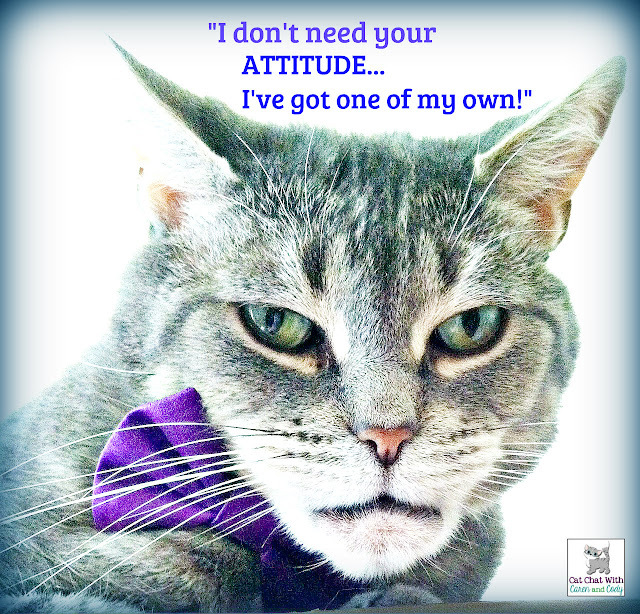 My Cattitude -- I may not be purrect, but I am always me! Cody, you are THE poster mancat for the word Attitude! Oh Cody, you are just perfection. Keep on being you! You're showing some serious cattitude Cody! Cattitude, attitude; it's all good, handsome boy!